William D. Neal is a Founder and Senior Partner at SDR Consulting, a professional services and consulting firm specializing in advanced marketing information methods, processes and technologies. Since 1973, SDR has provided consulting, research, and project management services to over 1000 organizations, including many of the world's largest companies and several well-known management and marketing consulting firms. Bill has authored over 60 articles, tutorials, and seminars on marketing theory, methods and procedures. His articles have been published in a wide variety of publications, including Marketing Management, the Journal of Marketing Research, the Canadian Journal of Marketing Research, the Journal of Advertising Research, Marketing Research, the Journal of Legal Marketing, and CFO Magazine. He is considered a national expert in the fields of market segmentation, product positioning, product optimization, and brand equity. Most recently, he has co-authored, with Ron Strauss, Value Creation: The Power of Brand Equity, published in 2008 by Texere, an imprint of Cengage Learning/South-Western. He is on the Editorial Review Boards of Marketing Management and Marketing Research magazines and is an ad hoc reviewer for several other marketing publications. Bill has been very active in the American Marketing Association since 1978. From 1989 through 1995, he served on the Association's Executive Committee and from 1991 through 1993 as the Association's Chairman-Elect and Chairman of the Board of Directors. 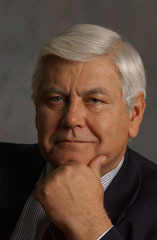 He is also a Past Chairman of of the Board of the Marketing Research Institute International. Bill was one of the two co-developers of the worldwide standard for basic training in the field of marketing research - the Principles of Marketing Research Online Certificate Course. This program is offered through the University of Georgia's Center for Continuing Education and endorsed by the Marketing Research Association, the American Marketing Association, the Advertising Research Foundation, the European Society of Opinion and Marketing Research, The Professional Marketing Research Society (Canada), and many other leading professional societies, worldwide. In 1995 Bill was the fourth person to receive AMA's Lifetime Achievement Award for service to the Profession of Marketing. Recognizing his long term contributions to the profession of marketing research, the Marketing Research Association awarded Bill an Honorary Lifetime Membership in 1997. In 2001 Bill was elected to receive the Parlin Award - the oldest and most prestigious award in Marketing Research.